The Central House project is located in the heart of the Roodepoort CBD at the corner of Van Wyk and Joubert Street. The project will entail the purchase and conversion of the Central House. The project will yield 2 bachelor, 107 one-bed and 11 two-bed units. The Italic Mansions project is located on 36 Plein Street in the Johannesburg CBD. The projects involve the acquisition and converting of 123 communal rooms into 64 self contained one bedroom flats. Lubraco House which is situated on Erf 532 and Erf 533 is a seven storey building with a basement. The project was a conversion of 7 storeys of office space to residential development to create 63 units; of 57x bachelor units (average 35 sq. metres) and 6x 1-bedroom units. The building also has 2 shops on the ground floor and a storage basement used by the shops. The Tau Village project is located on 279 Struben Street, Pretoria. The project entailed reconstruction and refurbishment from a hotel to a mixed use facility of 109 two storey walk-up housing units. This also includes accommodation for aged and communal accommodation for girls at risk and upgraded commercial space on the ground floor. In addition the project has a drop in centre and a baby care centre. The Allenby project is located on 45 Claim Street, Hillbrow. The project entailed refurbishment of quality communal units. They have installed a fingerprint identification system with turnstile gate to further improve the security of the building. The total number of units is 109. The Hlanganani project is located to the north-west of the Johannesburg’s city in the first of government’s mega integrated housing project – Cosmo City. 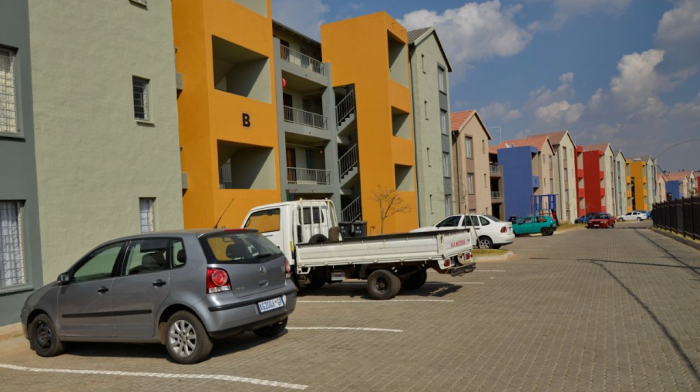 The Hlanganani project consists of 281 units in 21 blocks of two and three storey walk up townhouse type units with open parking bays. The entire development is fenced with a central security controlled entrance for vehicles and pedestrians. The Hlanganani project has a mix of one-bedroom, two-bedroom and three-bedroom units. The Montrose Mansions project is located on the corner of Von Wielligh and Jeppe Street in the Johannesburg CBD. The project entailed the acquisition and conversion of commercial office space to rental housing units. The project comprises of a twelve story building that accommodates 10 floors to 120 one bedroom units with 1st floor office and ground floor retail shops totalling 1382m2. The Orlando Ekhaya project is located on Nicholas Road behind the Orlando Power Station cooling towers in Orland East, Soweto. The project entailed Phase 1 – Conversion of Hostel Block A into 102 family units consisting of 24 one-bedroom units and 78 two-bedroom units. Phase 2 – Construction of a new 3 Storey walk up complex. This comprises of 18 blocks of 6 two-bedroom units each, a total of 108 two-bedroom units. The refurbishment of Block B will consist of 61 two-bedroom units. The total number of units is 266. The project is situated opposite the New Canada station and adjacent to New Canada Road. The project borders the Noordgesig Township. The project has easy access to Johannesburg’s City Centre via Main Reef Road. The project is a three storey walk-up development consisting of 9 blocks of housing units. Each block consists of +- 40 two-bedroom units with courtyards in the middle which serve as a common area for community activities, washing lines and the children’s play area. The total number of housing units is 200. The Roodepoort project is located within the Roodepoort CBD adjacent to the taxi rank and within walking distance to the retail sector in the CBD. The Roodepoort project consists of 432 two storey walk-up units. The project has a mix of one-bedroom and two-bedroom type of units. The project is located on stand 808 Germiston and stand 948 Delville in the Ekurhuleni metropolitan. The project comprises of 286 rental units with an average unit size of 44m2. This project is located on the outskirts of the Germiston, CBD. The project consist of 9 bachelor, 142 one bedroom, 221 two bedroom and 65 three bedroom units. The total number of unit is 437. The Manners Mansion is located on the corner of Pritchard and Sauer Street in the CBD. The project entailed the acquisition and refurbishment of Manners Mansion Building. The building comprises of a 13 storey building and has a combination of 80 residential units averaging 60m2 and 9 retail tenants at the ground floor. The Kliptown project is located in Kliptown, Soweto. The project was split into two phases: the Walter Sisulu Square project delivering 478 units and the Golf Course project delivering 932 units. The project is located between West and Bezuidenhout Street at the foot of the Nelson Mandela Bridge in the Johannesburg CBD. This project was done in two phases the 1st phase comprised of 631 units and the 2nd phase comprised of 178 units. The project comprises of a mixed use of 809 units. The project consists of low to moderate rise buildings, most being three storey walk-ups.